Nov. 19, 2003, marked the 10-year anniversary of the unanimous adoption by the U.N. Security Council of the “Roadmap” for Mideast peace. A decade later, lasting peace remains elusive as world leaders continue to misassign blame on Israel. The Roadmap was adopted in the midst of the raging Second Intifada that began in late September 2000, consisting of numerous terrorist bombings and heinous suicide attacks conducted by Palestinian terrorist organizations. In an act of self-defense, Israel began construction of a terrorism-prevention security fence through portions of the West Bank — an act that has become enmeshed in international controversy and has reaped untold and unjustified criticism upon Israel. In the midst of the violence, President George W. Bush delivered a speech in the Rose Garden of the White House on June 24, 2002, reflecting moral clarity. The president called on “the Palestinian people to elect new leaders, leaders not compromised by terror.” He further declared that so long as terrorists victimize Israeli citizens, “Israel will continue to defend herself.” Rather than hide behind diplomatic euphemisms, President Bush bemoaned the fact that Palestinian leaders were indeed “compromised by terror.” If only the Palestinian people would begin implementing necessary reforms, the president promised the support of the world community in establishing an independent Palestinian state. As the international president of B’nai B’rith International at the time, I wrote the president expressing full support for his vision and goal to create two states for two peoples — the Palestinian people and the Jewish people. The acts of terror against Israel and the violence of the Second Intifada continued. Yet, in October 2003, the U.N. Security Council considered a resolution, vetoed by the United States, condemning Israel for its construction of the security fence without addressing the onslaught of terror being suffered by Israel on a daily basis. The U.N. General Assembly (“UNGA”) subsequently adopted a resolution of condemnation (UN A/RES/ES-10/13). Regrettably, the resolution’s concurrent condemnation of suicide bombings and of the fence improperly implied a moral equivalency between harming the innocent and protecting the innocent. Ten years ago this day, and seized of the matter of peace and security between Israel and the Palestinians, the U.N. Security Council adopted the Roadmap for Peace, also approved by the U.S., Russia, the EU, Israel and the Palestinians. The Roadmap provided for a permanent two-state solution to the Israeli-Palestinian conflict. This Roadmap expressed “grave concern at the continuation of the tragic and violent events in the Middle East” and called for a “cessation of all acts of violence, including all acts of terrorism, provocation, incitement and destruction.” The Quartet appointed former U.K. Prime Minister Tony Blair, who continues his efforts as its envoy for Middle East peace. Yet, on Dec. 8, 2003, which will be 10 years next month, contrary to any semblance of objectivity, and in violation of the U.N. Charter, the UNGA approved a resolution seeking an advisory opinion of the International Court of Justice (ICJ) on the “legal consequences” of the construction of the terrorism-prevention security fence, referred to in the resolution as the “wall” (UNA/RES/ES-10/14). The ICJ, over the objections of the United States, Israel and other countries that contested the jurisdiction of the ICJ to consider the case and to issue the advisory opinion as to the question referred to it by the UNGA, accepted jurisdiction over the question. In February 2004, the ICJ convened hearings at the Peace Palace in the Hague. Appearing to protest the ICJ proceedings, victims of the Second Intifada vividly drew attention to the daily onslaught of terror in the region by gathering in front of the gate to the Peace Palace with a burned-out Egged bus brought to the Hague. At the same time, hearings on behalf of victims of the Second Intifada were convened by the Center for Documentation and Information on Israel (“CIDI”) at the Old City Hall of the Hague in the presence of European and Dutch members of Parliament. At these hearings, victims of terrorism depicted the horror, anguish and suffering they endured at the hands of Palestinian terrorists. At those hearings, I served as lead counsel on behalf of the victims who addressed not the International Court of Justice, but the court of world opinion. Yet, ignoring reality and the justification for construction of a security fence/barrier, parts of which indeed are made of concrete to stop stones, grenades and other attacks, the ICJ castigated Israel in its advisory opinion on the security fence, giving no credence to the necessity of constructing the barrier in an effort to protect Israeli citizens, residents, workers and visitors from terrorist attacks nor any deference to the decision of the Israeli High Court of Justice ordering rerouting of portions of the security barrier. 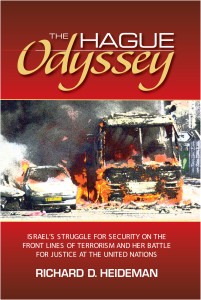 I have written extensively on Israel’s struggle against terrorism and battle for justice at the U.N., including the ICJ, in my recently released book The Hague Odyssey: Israel’s Struggle for Security on the Front Lines of Terrorism and Her Battle for Justice at the United Nations (Bartleby Press, 2013). Simply put, in the years following the U.N.’s condemnation of the security fence, the fence has saved an untold number of lives. Last month, I addressed the International Association of Jewish Lawyers and Jurists Conference at the Peace Palace Library in the Hague, returning after 10 years. I stressed that Israel, like every other nation-state committed to the rule of law, justice, human dignity and human rights, has acted properly in providing security and protection for her people, notwithstanding the criticisms of the ICJ. Even today, the fence provides protection against a threatened Third Intifada. The Roadmap is 10 years old, but long in the making. In 2002, President Bush pointedly declared that “a Palestinian state will never be created by terror — it will be built through reform… .” But the world exhibits a stubborn and wrongheaded pattern of placing the blame on Israel. U.S. Secretary of State John Kerry, working to bring the Israelis and Palestinians toward an agreement in keeping with the Roadmap, has encountered numerous challenges in overseeing the negotiations. In a TV interview last week with Israeli and Palestinian journalists, Kerry referenced the existence of the “wall,” Israeli settlements and Israeli Defense Force operations in the West Bank as if it is Israel who is to blame for the inability to achieve a lasting peace. The interview, surprising to many since Secretary Kerry has reserved unto himself the right to make public statements about the negotiations, included a reference to a looming Third Intifada should the negotiations fail. Secretary Kerry reportedly has stated that Israel’s policies may create an “increasing feeling that if we cannot get peace with a leadership that is committed to nonviolence, you may wind up with leadership that is committed to violence.” This statement has been interpreted by many to suggest a belief that the present Palestinian leadership indeed is committed to peace and the failure to achieve peace rests with Israel. Reality suggests otherwise. Not everything wrong in the Middle East can be blamed on Israel. One must look to the root reasons for Israel’s actions: to defend and protect her people and to assure security for Israel, the nation-state of the Jewish people living side by side in peace and security with her neighbors — indeed, in a dangerous neighborhood. Blurring the lines of responsibility for the failure of the Roadmap to achieve a permanent agreement will not resolve the issues between the parties nor achieve the result envisioned under the Roadmap. For the majority of Palestinians yearning for a stable society in which to thrive and for Israeli citizens longing for a daily life free of terrorist threats, a permanent peace cannot come soon enough. As of Nov. 19, these millions of people have waited 10 years since the unanimous adoption of the Roadmap for Peace gave much hope for an imminent end to the violence and terror. A lasting peace will only ensue when the actions and words of all pursue the same ends. Ten years and counting is far too long. Richard D. Heideman, senior counsel of Heideman Nudelman & Kalik, P.C., is a Washington, D.C.-based international human rights attorney who represents victims of terrorism.